Ao Li was born in Hunan Province. Ever since she was a young girl, she loved to paint and draw. She always knew that she wanted to be an artist. In 2002 she left her job in the insurance office, enrolled at Hangzou University, Zhong Guo Mei Artist School and began studying drawing and oil painting full time. In 2004 she attended an advanced course in oil painting at the Shanghai oil Painting and Sculpture Institute. During the course she received direction from several famous oil painters, including Yu Xiao Fu, Zhang Zheng Gang, Wang Shen Sheng and Yin Xiong. Later she became the student of famous oil painting master, Mr Chen Yi Fei. After this kind teacher looked at Ao li’s oil painting portfolio, he commented highly of her. “Your works have the divine and wonderful spirit, through them I can feel an artists’ rich emotional world, and the rigid pursuit of the true, the good and the beautiful. Your work represents yourself, you are very hopeful.” Sorrowfully, Mr Chen passed away because of long times spent in tiring hard work. Ao was deeply saddened at losing the great teacher. Later, Mr Chen’s younger brother, Mr Chen Yiming, the well known oil painting master who has worked in New York, stretched out warm hands and received Ao as his student. With his help and instruction, Ao’s painting skills have been enhanced greatly. In 2005 she was invited to participate in the seventh session of The International Art Festival. In 2005 she participated in the ‘International Art Exposition’. In 2005 participated in the Shanghai First Session of International Collectors Exposition. In 2005 participated in “Eastern Gold Fall” cultural exchange series of activities and was invited to exhibit her oil paintings. Commercial Federation Art Market Alliance Exhibition and the Shanghai Art Exposition Spring salon. 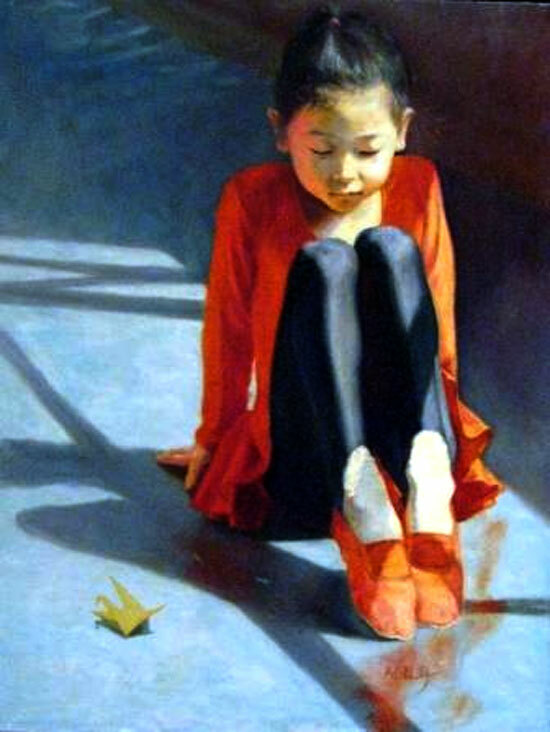 In 2007 an oil painting, size 60 X 80cm, called Red Dancing Shoes, was exhibited at Shanghai Art Museum. Ao’s work has been exhibited many times in art exhibitions at home and abroad and also published in specialized periodicals. Her work was chosen for the cover of a special edition of the Shanghai Artist, a magazine which features young oil painters and sculptors. Collectors from America, Canada, New Zealand, Japan, Korea, and Singapore have her works, as well as domestic enterprises and individuals.